Music remembers me - Connection and wellbeing in dementia brings to life the experience of people living with dementia and their interaction with music through an Australian-first project involving more than 700 aged care residents. While a diagnosis of dementia may be stressful and challenging, this book equips people living with dementia and those who support them with positive, meaningful ways of using music to enjoy experiences together-maximising feeling and connection. Music remembers me includes moving stories from music engagement at HammondCare - one of Australia's leading health and aged care providers - along with practical advice and tips about introducing music into daily care. 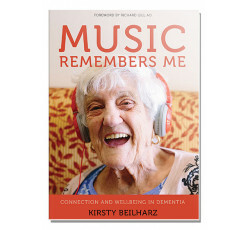 Author Kirsty Beilharz has woven together fascinating insights into music, our brains and dementia with practical advice on music engagement. This ground-breaking book is written with the general reader in mind and is certain to be a vital resource for supporting people living with dementia in Australia and around the world. Dr Kirsty Beilharz is Director of Music Engagement at HammondCare and a Visiting Fellow at the University of Edinburgh UK, applying music research in the context of aged, restorative and palliative care, with a focus on music in dementia research. She is former Professor of Music, Sound and Interaction Design at the University of Technology, Sydney Australia. Previously, she was Digital Media Program Director at the University of Sydney Design Lab from 2001-2008. Kirsty is an internationally recognised composer and interactive media artist. Her ensemble, orchestral and electronic compositions have been performed around the world (by the Sydney, Melbourne, Tasmanian and Western Australian Symphony Orchestras, Australian Chamber Orchestra, Ensemble Recherche Freiburg, and Nouvel Ensemble Moderne Montréal, at Bondi Sculpture by the Sea, Gaudeamus Music Festival, Hannover Biennale, and Paris Rostrum). She has won numerous prizes and awards and was a Young Australian of the Year finalist. Based in Sydney, Kirsty has also worked and studied in the UK, France and Japan. She plays violin, viola, shakuhachi, Baroque recorder, and studies therapeutic harp.